During my internship at Massachusetts General Hospital, I was fortunate to work on the Dialectical Behavior Therapy (DBT) team, where I participated as a DBT co-leader and individual therapist. I was struck by how well interpersonal theory fit into the DBT principles. For this clinical angle segment, I’d like to discuss the integration points between DBT and the interpersonal circle. Dialectical Behavior Therapy (Linehan, 1993; 2015) is a cognitive-behavioral treatment designed to treat patients with suicidality, emotion dysregulation, and borderline personality disorder. The typical framework includes one individual (50 minute) session, and one group session (ranging from 1.5 to 2.5 hrs. depending on location implementing the group). Additionally, patients can make use of phone coaching with their therapist, in times of distress. Therapists can make use of a weekly consultation team designed to support therapists who have a caseload of severe or complex patients. Like many CBT treatments, DBT discusses the importance of change and introduces patients to the cognitive-affect-behavior model. Additionally, DBT adds the concept of acceptance for painful emotions and unchangeable circumstances. The balance of change and acceptance strategies forms a dialectic of treatment progress for the patient (e.g. I accept that I am trying as hard as I can, and there is still more work to do). The skills portion of DBT is operationalized through 2 modules of change based skills (interpersonal effectiveness, emotion regulation), and 2 modules of acceptance based skills (mindfulness, distress tolerance). The clearest overlap with the interpersonal circle is found in the interpersonal effectiveness skills. The objectives goal is to balance (your) priorities and (others) demands. Specifically, it helps patients find the words to ask for what they need, or to refuse an unreasonable request. The formula for doing this follows the acronym DEAR MAN, with the first word being what to do, and the second word being how to do it. DEAR represents the steps of describing (facts), expressing (emotions, opinions), asserting (specific requests), and reinforcing (explaining consequences). Problems arise when patients start with the assert, without building the context for their assert (e.g. what are the facts that make this request understandable). Patients also have difficulty distinguishing a describe (e.g. my husband turns on the TV while I am speaking to him), from an express (i.e. makes me feel underappreciated). Finally, patients often leave off the reinforce, make the reinforce unreasonable (e.g. I will leave you if you watch the TV when I’m speaking), or forget that reinforcement can be positive (e.g. If you turn off the TV in the future it will really mean a lot to me). MAN ensures that the patient executes the DEAR statement in a mindful way (of one’s objectives), appearing confident (confident tone to promote agentic reciprocity), and willing to negotiate (flexible to alternative solutions, short term submissive position in service of the overall objective being met). Thus, the DEAR MAN structure provides the patient with specifics on how to enact an agentic request, and provides the clinician with specifics to diagnose where agentic complementarity breaks down. In other words, if both are dominant, the DEAR MAN can help the therapist diagnose aspects of the conversation that may have led to that anti-complementary exchange (e.g. neither party described the facts, one party used reinforcements that amplified the conflict, one party refused to negotiate). When both are submissive, the therapist might similarly be able to diagnose the source of the disconnection (e.g. neither party was willing to assert, hoping that their expression of feelings would communicate their unspoken needs). The self-respect objective is to build and promote self-respect by interacting in a way that makes the patient feel competent, and balanced in their integration of thoughts and emotions (i.e. wise mind). The acronym FAST, suggests that the patient be fair (to themselves, others), not apologize, stick to their values, and be truthful. The fair aspect guards against unmitigated agency (i.e. pursuing goals with too much dominance), yet also suggests that submissive behaviors (apologizing, abandoning values) is not an effective way to manage excessive agency. Here, I think agentic complementarity adds coherence to what previously appeared to be four disconnected skills (FAST). The relationship objective is to act in a way that others like and respect you, managing the goals of short and long term relationships. Importantly, these skills can be used even (and especially) in times of conflict. The acronym GIVE represents the strategy of being gentile (courteous, avoid attacks), interested (acting interested in other’s perspective), validate (acknowledge other’s feelings), and easy manner (light hearted, smiling, be friendly). Essentially, the give skills are specific ways to increase communion during conflict, and a reminder that communion is an important part of any agentic exchange. In other words, agency and communion are orthogonal, and one can ask for something (higher agency) in a nice way (higher communion). Relatedly, being nice is not the same thing as being weak. And being mean is not necessary to be assertive. I feel interpersonal theory adds an important organizing structure to the interpersonal effectiveness skills. In particular, interpersonal effectiveness skills are organized around an exchange where the patient needs to be dominant, and is hoping for agentic reciprocity in their exchange. The theory explicitly considers how adding a dose of communion to the request is useful, and providing patients with this simplified two dimensional structure (agency and communion) is often easier for the patient to comprehend initially. At the same time, for some patients the suggestion to reduce their dominance or increase their communion does little to help them because they don’t know how. Here, interpersonal effectiveness skills provide a roadmap for the ways to increase communion (GIVE) and manage the exchange of agency without loss of one’s goals (FAST). 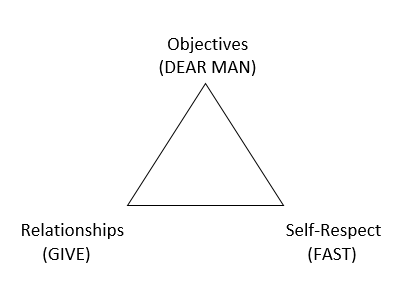 The DEAR MAN framework provides an explicit roadmap for handling agentic complementarity situations more effectively, and patients are often thankful for that level of scaffolding. In conclusion, the interpersonal circle provides an organizing framework to understand the interpersonal effectiveness skills, while the interpersonal effectiveness skills add some nuance and descriptive insights into how agency and communion can be managed during an interpersonal exchange. Linehan, M.M. (2015). DBT Skills Training Manual (2nd ed.). New York: Guilford Press.